For more information on table and advertising packages please contact us. After a record-breaking 20th anniversary year, the UK’s largest interactive sports quiz returns to The Brewery in 2019. Join some of the sporting world’s most famous faces as they come together with blue-chip companies from across the country to raise money for the Bobby Moore Fund. 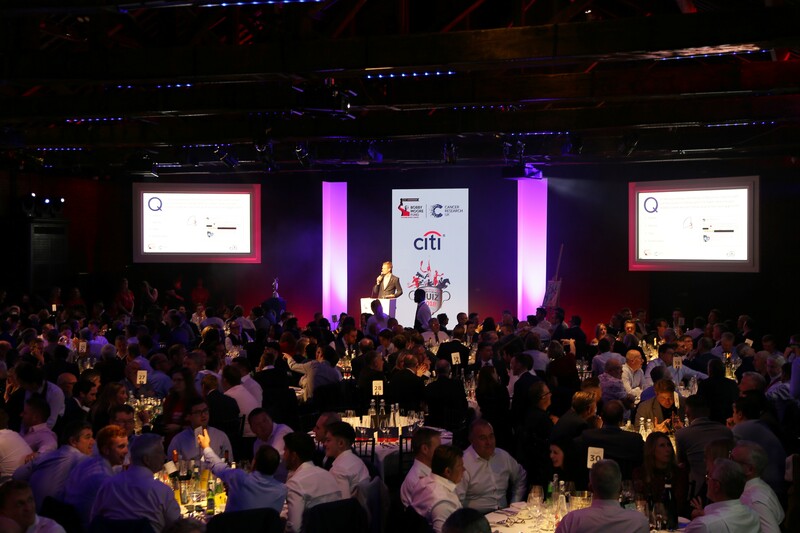 The London Celebrity Sports Quiz is the flagship event of the Bobby Moore Fund and sees over 500 guests battle it out in the UK’s largest interactive sports quiz. Hosted by stars of the sports broadcasting world including Jeff Stelling, Dan Walker & Claire Balding this event is one not to be missed. VIP drinks reception on arrival with sponsors and celebrity guests. Complimentary champagne for the table. A meet-and-greet with Stephanie Moore MBE. Bobby Moore was just 51 years old when he died. The Bobby Moore Fund for Cancer Research UK was set up by Stephanie Moore MBE, Bobby’s widow, in his memory to fund pioneering, life-saving bowel cancer research. Since the fund was set up in 1993 mortality rates have fallen by more than 30% and but we still have so much more to do. Our purpose is simple – to bring forward the day when bowel cancer is cured. There is both a live and interactive auction on the night to raise vital funds for the Bobby Moore Fund. If you or your company have any way to support the night through donating a prize that would be greatly appreciated.